Mary C. O'Brien and Vashti O'Brien were the daughters of John Logan "Jack" O'Brien and Remica Shoemaker. John was born circa 1799 in Tyrone, Ireland. On 21 June 1831, he and Remica, known as "Meeky" were married in Livingston County. Remica was the daughter of William Shoemaker and wife, Elizabeth, who came to Livingston County from Virginia. John Logan O'Brien, Jr., born 1833, died 1884. He married Sarah McElroy, dau. of Isaac Benjamin McElroy and Celia Wheeler-Crouch, on 19 Dec. 1860. Their children were: Nannie, Sarah, Rosa, Ellen, Virginia, and Benjamin. Mary C. O'Brien was born 26 Oct. 1834 in Caldwell County, KY, and died 6 June 1921 in Caldwell County, KY. She had a son, William L. O'Brien. Never married. Vashti O'Brien was born 22 Nov. 1836 in Caldwell County, KY, and died 25 Dec. 1923 in Caldwell County, KY. Never married. We the undersigned and possessed of various properties both real and personal in the County of Caldwell and State of Kentucky jointly and undivided and being sound in mind and memory do hereby make and acknowledge this to be our last will and testament. Witnesseth: that the first one dyeing (sic) then all property both personal and real shall revert to the surviving partner then at the death of the other or last surviving partner then it is our wish and will that after just debts and burying expenses shall have been paid the remainder of all personal and real estate wherever found shall be paid or transferred by our Executor or the court to Wm. L. Obrian Son of Mary C. OBrian. We hereby name and appoint W.R. McChesney as Executor of this our last Will and Testament. 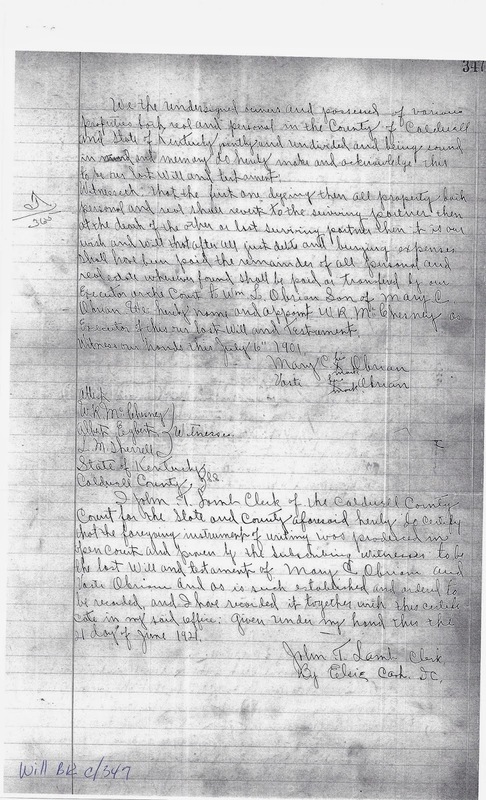 I, John T. Lamb, Clerk of the Caldwell County Court for the State and County aforesaid do certify that the foregoing instrument of writing was produced in open court and proven by the subscribing witnesses to be the last Will and Testament of Mary C. Obrian and Vasti Obrian and is such established and ordered to be recorded, and I have recorded it together with this certificate in my said office: given under my hand this the 21 day of June 1921.